Cairo’s newest art space, Heytan, which aims to develop and highlight street art, opens with an exhibition on a long-term project on street vendors — Published in Ahram Online. Heytan — Arabic for Walls — is a project about which there has been much talk for almost three years. It was meant to open in early 2012, originally as Egypt’s first space soley dedicated to street art. The opening never took place and the project continued to arise in conversations in activist and culture circles for the next two years. An initiative of Egyptian blogger Mahmoud Salem, widely known by the blogosphere name Sandmonkey, and self-taught Egyptian street artist Mohamed El-Mosheer, Heytan has been years in the making. The space was given to the artist and activist by Ismailia for Real Estate Development, who have been steadily buying property in Downotown Cairo and renovating the buildings, aiming to bring back its “glory days.” The company has been supporting the independent art scene with spaces for years, including the Townhouse Gallery and the Contemporary Image Collective, among others. As one enters into the run-down building on the corner of Kasr El-Nil Street and Sherif Street, Heytan is found on the fourth floor, and maintains the grungy feel of the entire building with its seemingly improvised finishing. The story of Heytan’s establishment is hung up with masking tape, with paint jar covers thrown next to it, and the whole space feels like it stays true to its mission: being a space dedicated to hosting conversations on, and archiving, Egypt’s growing street art movement. The space has grand ambitions, but as a start Heytan is set on working on three areas. The first is the street art archive, which will be hosted online. The archive will give to users the ability to upload their own material, whether photos of street art, projects in progress, or journalistic commentary on the movement. Next to that, Heytan will begin with workshops on multi-layered stencilling, large-scale murals and Arabic handwriting. Finally, for the launch, Heytan will host exhibitions centered around street art. While Egyptian street art has since the 2011 revolution been continuously stained with a hint of politics, Heytan’s first project, ‘Kefahteya,’ takes on the more social issue of street vendors. The project is a joint production by El-Mosheer and Amira El-Asmar. The first room of the space is filled with multi-layered stencils, some of them built with more than 28 layers, portraying famous Downtown street vendors. Sameh, famous for his kiosk on Hoda Shaarawi, which in addition to Egyptian kiosk staples such as cigarettes, crisps and other snacks, makes sandwiches out of everyday items one might find in one’s own fridge. 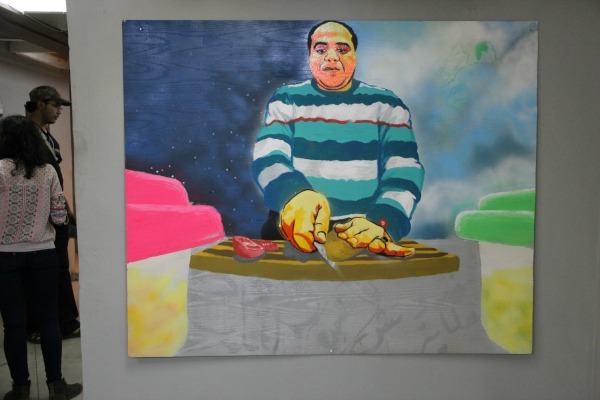 Sameh is portrayed making a sandwich surrounded by colourful pots of fillings. Across from Sameh one sees the famous Om Amira, the lady who makes potatoes in Bab Al-Louq, in the south of Downtown Cairo. Om Amira has recently been the star in a documentary by Ahmed Naji that made it to the Berlin Film Festival this year. 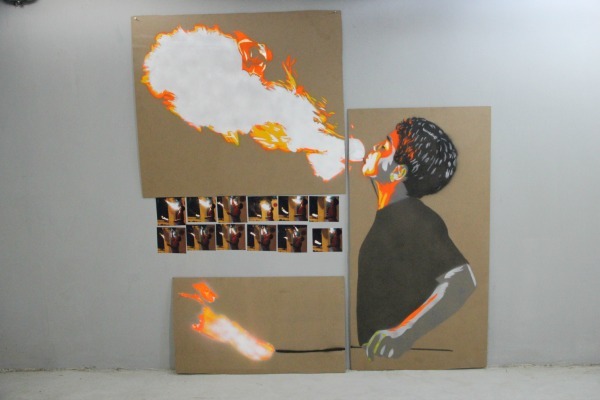 The room also features a portrait of a young boy who breathes fire for entertainment on the street, and a seemingly angry woman who sells Egypt’s baladi (popular) bread on the sidewalk. The opening exhibition was attended by several of the street vendors and their families. According to El-Mosheer, this is part of the core vision of Heytan: to bring arts to people who rarely have access to it, as this is also a purpose street art fulfils. The next room hosts a mural of Downtown, featuring several vendors, giving viewers a wider look into the issue in question. Finally, in addition to photography of the vendors in the corridors, audiences are led to a room that hosts a short documentary on the project. 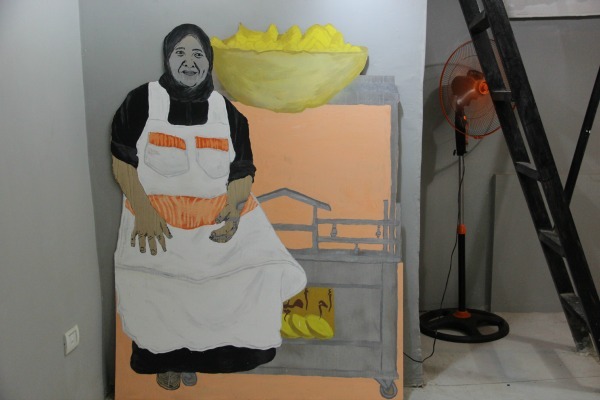 El-Mosheer and El-Asmar spent three months working with the street vendors featured in the exhibition, and others, in addition to months of preparation before the project. ‘Kefahteya’ is about highlighting these vendors and their work through stencils in Downtown, many of which were removed by the authorities. The artists also used their skills to intervene in the vendors’ businesses, helping them brand themselves. They painted a bowl of potatoes and Om Amira’s name on her cart, painted a mural of the young boy who breathes fire to help iconise his work, and painted a mural of the man who shines shoes near Nadwa cafe. Perhaps the most interesting of these interventions was at Sameh’s sandwich kiosk. The artists branded his kiosk, painted a menu on his windows of the sandwiches available, and on the wall next to him painted a stencil of him as a superhero. However, the superhero resembled Egypt’s President Abdel-Fattah El-Sisi. The duo ended their project in Cairo, but hope to expand the concept in the future to Minya in Upper Egypt and the Nile Delta city of Mansoura.